The fastest SSDs solutions on the market nowadays are the PCIe NVMe devices, but these usually come in non-external forms since there is no external PCIe connector, and, to compensate for this, OEMs use the Thunderbolt 3 connection. Among the latest Thunderbolt 3 external SSDs presented at CES 2018, Patriot’s EVLVR seems to have the most affordable price yet. The EVLVR Thunderbolt 3 SSD is incased in a “candybar” form-factor metallic chassis with rounded edges measuring 3.3 x 1.5 inches. Storing capacities range from 256 GB to 1 TB and the SSD features an NVMe 1.2 Phison PS5008-E8 controller based on the PCIe 3.0 X2 interface connected to Toshiba’s BiCS3 TLC NAND memory package. Thanks to the NVMe controller, the sequential reading speeds can reach up to 1.5 GB/s, while the sequential write speeds can reach up to 1 GB/s. Conveniently, the SSD does not require any power chords, as it gets the necessary 15 W from the Thunderbolt 3 connection. Patriot’s solution might not be as fast as other internal PCIe 3.0 X4 SSDs, but the pricing of the new EVLVR models may provide an edge over the competition. 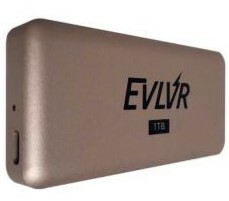 The 256 GB version of the EVLVR has an MSRP of only US$199.99, whereas the 512 GB model is priced at US$289.99, and the 1 TB variant costs US$489.99. Availability is expected for March.